At waxing Moon half-lit, we are called to pause, examine, reflect, and re-form our sense of balance. 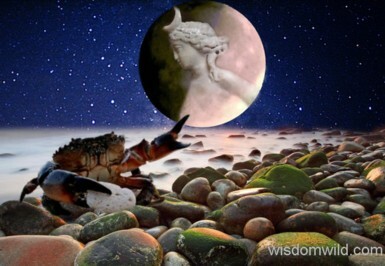 Cancer Moon brings the gifts of sensitivity, tenderness, compassion, and nurturance. Aries Sun brings passion, fearlessness and excitement. Together they invite us to explore the balance between feeling and doing; between inner reflection and outward expression. We are prompted to activate a harmonious, mutually supportive interplay of the gifts Moon and Sun bring. Thoughts and actions have real staying power right now and, despite feelings of impatience or restlessness that may arise and ‘Fire’ things up (Moon-Mars opposition), it is important be calm, mindful, and not rush to action/expression (Mercury-retrograde). While Air energy (mental acuity) is still ‘thin’, we are supported by elemental energies that are otherwise more ‘balanced’ than they have been in recent weeks. Breathe in ease and draw on the Waters for flow and nurturance; on Fire to activate your passion; and on Earth for deep grounding. From this place of great strength, reach for the Moon! harmonious interplay of feeling and doing this Moon!